While June was a busy month for racing, July and early August are reserved for a solid training block to get ready for the second half of race season. I'm averaging about 12 workout sessions a week for swim, bike, run, and strength training. That translates to roughly two-a-day workouts six days a week and one day off. Sessions of course vary in intensity, duration, and purpose. Coach Jim and Kurt keep things fun and interesting (busy brain = happy me) and it is very rare that I don't look forward to a workout. I try to knock out both workouts one after the other early in the morning to push my endurance and to keep the day clear. I know I'm gaining strength and confidence and ideally that will translate to upcoming races August 13, 14, and 20. The tendonitis is all but gone thanks to a mix of ice, acupuncture, massage, and strengthening, and so is the bit of pre-run anxiety I had been experiencing because of it. It feels great! Today's challenge was tough too. It was a 7-mile tempo run but with two consecutive miles done "around a 6:50 pace." My best ever 5K was a 21:15, so a 6:51 pace a year and a half ago, when I was rested, and the course was flat. Today I ran on the rolling road in our valley. After a two mile warmup I got to work and ground out the next two miles at 6:51 and a 6:48. My average heart rate was 174. 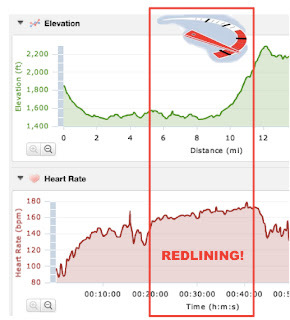 REDLINE Those two miles came with a great deal of groaning and the same audio tape rolling in my head, "I'm not liking you too much right now, Coach Jim. Did you not know how much it would hurt?!!!" There are a lot of walkers on this road, and if any of them had considered taking up running, one look at me probably convinced them running was a bad idea! As hard as some of this stuff is, I just eat it up. I don't know why. I mean, I am just giddy thinking about it. Yeah, things hurt but it's temporary. I love the mental challenge of pushing aside negative thoughts and overriding my body trying to tell me to stop. This is the attitude I'll take with me into the Luray Double (Oly + Sprint) and Nationals. One more thing -- today was the first time in ages that I thought back to January and February's cast, crutches, and boot, and how far I have come from that injury thanks to the help of many and the grace of God. It's nice to be to the point where I have mostly forgotten about it. Enjoy the weekend folks and tear it up on those workouts!! Remember to be grateful that you can swim/bike/run/lift/etc. It's truly a gift. Day OFF from training means day ON for adventure!